Uplifting Love: What can doing the dishes do for you? What can doing the dishes do for you? When was the last time you SHOWED your spouse that you are grateful for them? How did you show it? Gratitude is critical in a relationship (I've mentioned this before here and here). 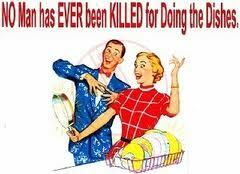 The doing the dishes comment reminded me that while I tell my wife I am grateful for her I really need to show her. And it's not necessarily always easy to do. The best gestures of gratitude are the ones that require us to actually know our spouse. What does he love? What does she hate to do? In my team member's marriage for her it is the dishes. When her husband does the dishes he is showing his love for her, his understanding of her, and his gratitude for her. ﻿﻿﻿﻿TIP: don't always do the same thing to show your gratitude. Find several ways and rotate through them while always being on the lookout for new ways to express your thanks. How are you going to show your gratitude for your spouse this week? Doing the dishes is awesome!!! It is sooo simple, but it really makes my day, when my hubby tells me after dinner, that I should sit on the sofa and do "stuff" and that he would take care of the kitchen. You get married to stay married! What do you mean you got the children ready? Tweet, Tweet. What the heck?! Loving Acts Say "I Love You"